This is a great idea! This was shared with me on Facebook, and I liked it so much that I made my own jar. So often we are tempted to forget all the “good stuff” that happens to us daily and remember only the bad. This jar will help to remind us of all those wonderful things that we experience throughout the year. Here is how to make a jar of your own. 1. Find a jar or can with a lid. 2. Decorate it and personalize it. 3. Keep the jar in a place where you will see it. 5. Write down those “Good” moments! 6. 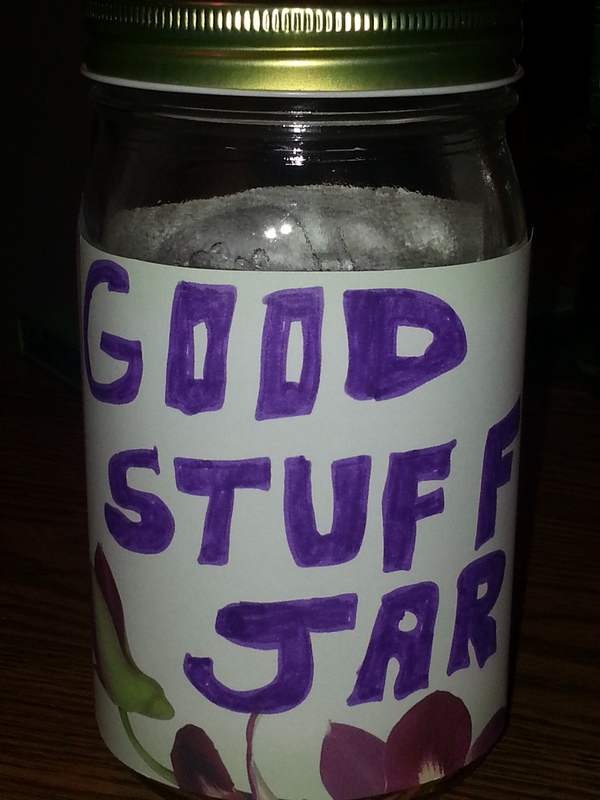 Open the jar on New Year’s Eve 2013 and experience all those “Good Stuff” times all over again. Posted in How to do stuff and tagged 2013, good stuff, Grandmother Musings, Idea, New Year, Positive Thoughts, post it pad, postaday, The Good Stuff Jar. Bookmark the permalink.